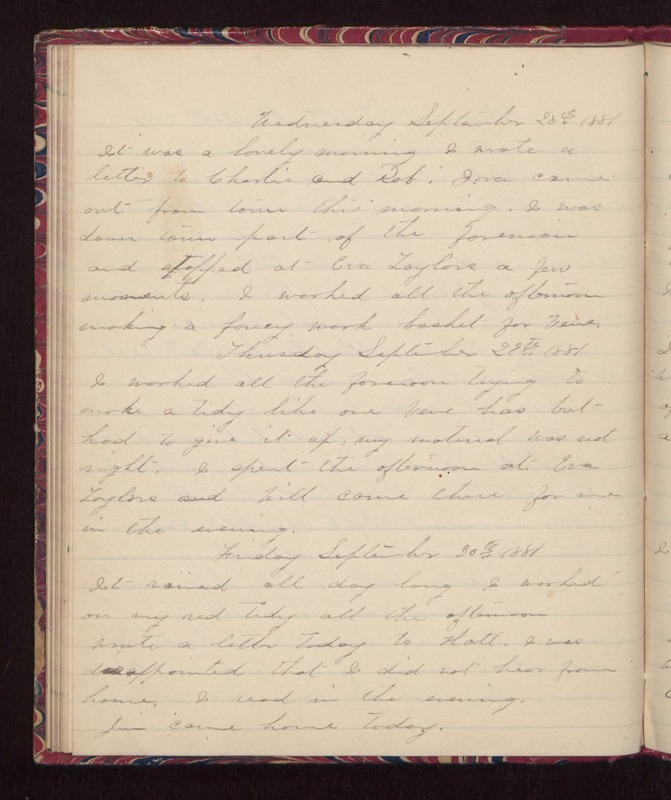 Wednesday September 28th 1881 It was a lovely morning I wrote a letter to Charlie and Rob. Ira came out from town this morning. I was down town part of the forenoon and stopped at Eva Taylors a few moments. I worked all the afternoon making a fancy work basket for Vene. Thursday September 29th 1881 I worked all the forenoon trying to make a tidy like one Vene has but had to give it up, my material was not right. I spent the afternoon at Eva Taylors and Will come there for me in the evening. Friday September 30th 1881 It rained all day long. I worked on my red tidy all the afternoon. Wrote a letter today to Hatt. I was disappointed that I did not hear from home. I read in the evening. Jim came home today.